With the holidays almost upon us here in Melbourne, I thought I would share 5 ideas to keep bigger kids busy. This is one of my daughter's favorite things to do and can be modified according to your child's age. It's simple really, I just give my girl a topic and she has to find 20 facts on that topic. When she was younger, it used to be just 10. She uses the computer and reference books to find her facts. Sometimes I'll be specific and say "I'd like you to find 10 facts from a book and 10 facts on the computer". I think it's important kids know how to research topics they're interested in and that they can use a variety of resources to find facts, not just trusty old Google! We tend to stick to places and animals. For a first timer, you could give them a few ideas eg. For an animal they could find where it lives, what it eats, it's predators are etc. 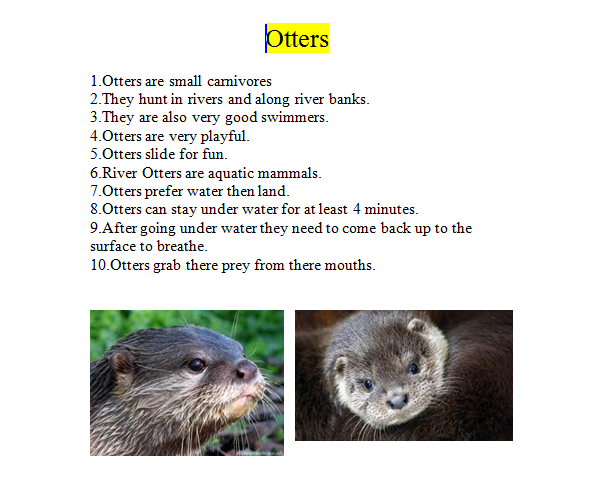 We collect up all the fact sheets and keep them in a folder. This activity builds research skills, literacy skills, computer skills and gets kids thinking about the everyday world. This is similar to the fact sheet idea, but I choose a topic that is a little more general and I give Em specific questions that she has to find the answers to. It usually starts with a conversation about a topic she's interested in. 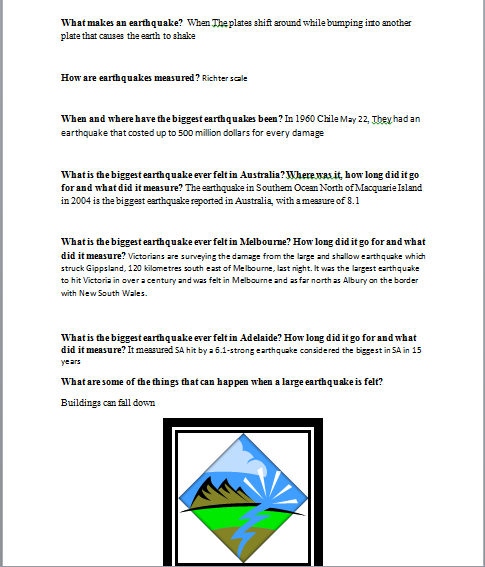 We had an earthquake here in Melbourne just the other day, so she did a project on that. You can see her efforts below. This builds similar skills to the fact sheet, but it hones research skills slightly because it asks the child to find specific facts. It also really works a child's ability to read text and find meaning on it. This is a really important literacy skill. We love making books at our house. This is a great activity for kids around 5-7 who are just starting to spell and write on their own. A great way to help it along is to put together a sheet of words that your child might use in their book but need help spelling. Ed just recently made a book about Mr Scribble, but needed help to write 'scribble'. I wrote out the words he needed first so he could work independently. This is great for spelling, writing, drawing and also planning how a story takes shape. It works on imagination and creativity and is a great self-esteem boost once it's finished. Start with just a few pages for really early writers. Ed's book was just 3 pages long for his first go. Painting with bigger kids is loads of fun. I like to give them just a few colours - red, yellow, blue, black and white and allow them to mix their own colours in an egg carton. They can paint onto paper or canvas and you can either give them something to sketch and paint or allow them to use their own imagiantion and creativity. For extra experimentation, you can try powder paints. This means kids can experiment with the texture and consistecy of the paint as well as the colour. Experimentation and creative expression help with creativity, language, recall, problem solving and knowledge about the world. It's easy to think that bigger kids are too old for pretend play, but children generally enjoy this sort of play until they're 10-12 years old and sometimes older. Bigger kids like details. They'll appreciate access to real food, torches, notebooks, lots of furry friends, dress ups, sleeping bags and pillows. And they'll also like having two or more cubby houses to move between. They great thing about bigger kids engaging in this sort of play is they can build their own houses and play around with size and shape on their own. They can also help to pack up too! Even for older ones, pretend play is great for self confidence, self esteem, problem solving, getting along, language skills, imagination and creativity. What do your big kids like to do? Nothing like making a book, a newspaper or a really big cubby, preferably with a tunnel or something to access it! My kids also love parlour games and board games; my six year old has just moved onto monopoly. Thanks for visiting my blog; I look forward to reading more of yours. Alison.